Hollie: The two sides of this family have never integrated well, so don't expect to make a lot of friends when you go there. Heather: Drew doesn't make friends, Mom. Writer/director Cameron Crowe is a very talented filmmaker, but his movies all walk a fine line between sentiment and outright sappiness. He got in right with Almost Famous, his unashamed ode to his younger days as a rock n' roll writer for Rolling Stone, but Elizabethtown, which was mauled by critics after premiering at the Toronto Film Festival and subsequently edited down before opening in theaters, missed the line altogether. The story of a big city, life-in-crisis son reconnecting with his past after coming home to bury a parent will sound familiar to anyone who has seen Garden State, a much more successful movie. This time around, the floundering hero is Drew Baylor (Orlando Bloom), who has just been fired from a cushy job designing sneakers for Phil (Alec Baldwin), because his new product flopped, losing the company a billion dollars. And though I find that about as realistic as the episode of The Simpsons in which Homer's concept car somehow bankrupts a giant automaker (didn't they do any test marketing? ), I'm sad to say that's far from the most unbelievable part of the movie. Drew decides he's going to commit suicide by taping a knife to an exercise bike, hopping on, and stabbing himself to death, because in this movie, even massive depression must be cutesy (also, there's no way a weenie like Drew would have the guts to take a knife in the chest; no noble Roman, he). Before he can, though, he gets a call from his sister (Judy Greer), who tells him their father has died suddenly. Drew decides to stave off his poorly planned hari-kari and jet back to help out with the funeral in Elizabethtown in place of his mother (Susan Sarandon), who is too neurotic to visit her in-laws. On the flight over, he meets Claire (Kirsten Dunst), a flight attendant so perky and positive and animated, she may as well be a cartoon. She's certainly never anything but an unrealistically idealized cinematic invention, to the point where she sort of comes off as creepy and fake. Her borderline stalker behavior will manifest later, though, when she pops back in to provide the third act love story closure. First, Drew has to deal with his equally broad extended family, a group that would probably be a little much even for the residents of Stars Hollow on Gilmore Girls (town motto: If you lived here, you'd already be annoying). There's the guy who does nothing but obsess about his glory days playing in a bar band that no one else liked, the father who gets the kids to behave by promising to blow up a house if they're good, and the cousin who thinks he looks exactly like Drew (it's funny because he looks nothing like Drew). Most of the movie is taken up by a bunch of slightly grating scenes as all these characters plan the funeral for Drew's father; Drew, meanwhile, sees his dad anew through their eyes. Or so I'll have to assume, since his journey is obscured under layers of idiosyncrasy and indulgence. Elizabethtown is mix tape filmmaking. It seems to work all right while you're watching it, but in the end, it's pretty clear that it's being held together by little more than directorial polish and a great soundtrack, without which the movie would totally fall apart (the climax, an admittedly great scene, is totally off the wall�here's a movie where it all comes down to a cover band playing Free Bird at a memorial service). The last 15 minutes or so is literally a cross-country road trip, giving Crowe the excuse to string together a bunch of great music and call it emotional closure. It looks like it would be a blast to actually do, but it isn't all that much fun to watch. Orlando Bloom proves himself more at home in elf ears and battle armor; as world-weary Drew, he conveys little more than doe-eyed vacancy. I don't know that anyone could play the role as written, and he's not exactly unlikable, but he just doesn't fit. Nor does Kirsten Dunst, who cranks up the cuteness to "box of puppies" and grates on the nerves. Granted, her character is a total fiction, with none of the depth or insecurities that made Kate Hudson seem so much better than usual in Almost Famous, so I can't fault her too much. Susan Sarandon does a nice job with her big scene, a stand-up routine at her husband's wake that seems to be out of a different movie, and it's always nice to see Judy Greer in anything, but you get the sense that actors this good should be given more to do, especially when so much of the movie meanders off track with for "local color" bits. Crowe's films have always been set in some alternate universe where everything is glossy and well lit and everyone speaks great dialogue. But his best movies�Jerry Maguire, Almost Famous�feel genuine, too. Elizabethtown is mannered, manufactured, a parody to excess of Crowe's style, an emotional journey that's too artificial to connect with. Because it is so highly polished, though, that it goes down easy, a pop song worth humming along to, but nothing that's going to get stuck in your head. 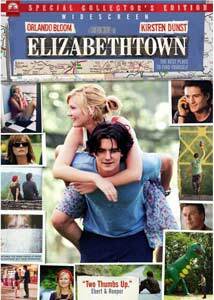 Image Transfer Review: Elizabethtown looks great on DVD. It's a very sunny movie, and the transfer shows it off with bright colors and excellent detail. There's minimal aliasing, but no obvious edge enhancement. Black level and shadow detail are both good. No complaints. Audio Transfer Review: For the most part, this film receives the typical, front-heavy comedy mix, with clear dialogue and a wide front soundstage. There are a lot of pop songs on the soundtrack, and they sound nice and full. But during a few sequences, including the emotional climax, set at a kicking wake, the surrounds and even the subwoofer really come to life. Extras Review: Elizabethtown's disastrous reception at the Toronto Film Festival seems to have really hit Cameron Crowe hard; he returned to the editing room to shorten the film by over 20 minutes and hasn't contributed much at all to the DVD (it's his only film save Singles, an early Warner release, that's missing a commentary track). None of that deleted footage is included here, which is sort of annoying. Even if it is generally accepted that the shorter cut is better, why not put at least some of the snipped material on the disc? I'd at least like to know more about what went wrong with Drew's awful shoes. Regardless, all that's here are two extended scenes, Rusty's Learning to Listen Part 8 and Hanging with Russell in Memphis, that don't add much that isn't in the movie already (the former is mostly repeated shots of a house exploding). Otherwise, there are two featurettes that hardly qualify to be called even that. Each runs a little over two minutes and offers a montage of behind the scenes footage set to (surprise!) a pop song. The first, Training Wheels, shows the actors rehearsing, and the second, Meet the Crew, is self-explanatory. Really, don't even bother watching them. Go back in time and don't bother reading about them, if it's an option. They exist only to be listed on the back of the box, as far as I'm concerned. The only worthwhile extras are a nice photo gallery, with a bunch of excellent behind the scenes shots, and two trailers, both of which sell the film very well. The disc starts off with previews for Ferris Bueller's Day Off and Yours, Mine & Ours. Elizabethtown has all the elements of a Cameron Crowe film, and it looks and sounds great, but it has all of the depth of a pop song. Too quirky and sentimental by half, it's not the total misfire its critical reputation suggests, but it's certainly an uninspired disappointment from a writer with such a unique voice.